EOSE, together with three partners from Malta, Lithuania and the Netherlands, is delighted to announce an initiative to encourage and create the conditions for the sport and physical activity sector to take part in learning mobility activities. The new EU funded project entitled T2MIS – Ticket to Mobility in Sport – will design and deliver the first online European Mobility Tool for the sport sector. Previously the sector has lacked the organisation and leadership to adopt a culture of learning mobility, T2MIS aims to address this gap. 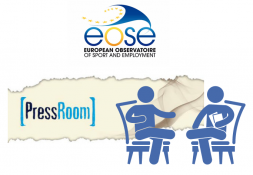 The European Observatoire of Sport and Employment (EOSE), is delighted to announce a new transnational initiative funded by the European Commission under Erasmus+. EOSE is the applicant and coordinator, and will work with a supporting partnership of 18 national partners and 5 European networks to deliver this exciting and challenging project entitled the ESSA-Sport project – “A European Sector Skills Alliance for Sport and Physical Activity”. Better skills supporting a more active society, through better quality services and better business in the sport sector: this could be the motto of the ESSA-Sport project. AT A GLANCE: promoting and supporting learning mobility for sport and active leisure stakeholders. This video was designed to present in a simple and pragmatic way the potential of learning mobility for the sport and active leisure sector with the aim to increase the level of awareness and take up, and to maximise the added value of mobility. This video is part of EOSE Work Plan for 2016 which has been funded with support from the European Commission. It reflects the views only of the author, and the Commission cannot be held responsible for any use which may be made of the information contained therein. 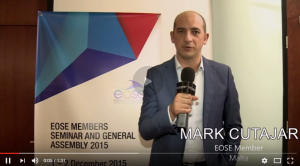 EOSE Press Room offers insight into EOSE world, vision and activities. In this seventh video, Mark Cutajar, EOSE Member, tells us about the benefits of Learning Mobility as a sending organisation. 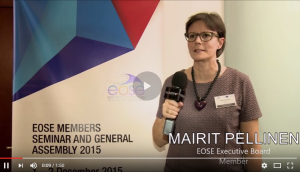 In this sixth video, Mairit Pellinen, EOSE Executive Board Member, tells us about the benefit of Learning Mobility as a host organisation. 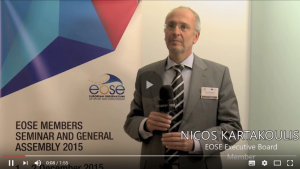 In this fifth video, Nicos Kartakoulis, EOSE members, tells us about the benefit of being a member and the vibrant atmosphere among EOSE, described as an innovative and transparent organisation facilitating teh transfer of knowledge.